Following a joint diplomatic effort by the UK and international partners, a group of White Helmets volunteers from southern Syria and their families have been able to leave Syria for safety. They are now being assisted by the UNHCR in Jordan pending international resettlement. The White Helmets have saved over 115,000 lives during the Syrian conflict, at great risk to their own. Many White Helmets volunteers have also been killed while doing their work – trying to rescue civilians trapped in bombarded buildings or providing first aid to injured civilians. White Helmets have been the target of attacks and, due to their high profile, we judged that, in these particular circumstances, the volunteers required immediate protection. We therefore took steps with the aim of affording that protection to as many of the volunteers and their families as possible. We pay tribute to the brave and selfless work that White Helmets volunteers have done to save Syrians on all sides of the conflict. “The government statement contains two bare-faced lies. The White Helmets most definitely have not assisted all sides in the conflict. From the beginning, they have only ever operated in rebel-held areas. Government controlled areas have the real Syrian Civil Defence and Syrian Red Crescent. This is quite a big whopper on the government’s part. It goes without saying that the media will not pick up on it. 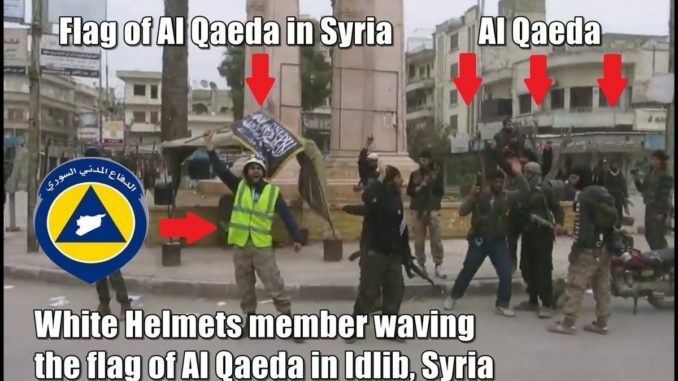 Secondly, the White Helmets are not volunteers. They are doing jobs for which they are paid, by Western governments. They have a press department 150 strong, bigger than that for the whole of the UK ambulance service. Their claims of saving over 115,000 lives have never been verified. The co-location of their offices with jihadi operation centres has been well documented. 2. Why should White Helmets be considered to be more at risk than combatants, many of whom have either ‘reconciled’ or been bussed out? In the demonology of the government side, the White Helmets are not seen as worse than other jihadis.